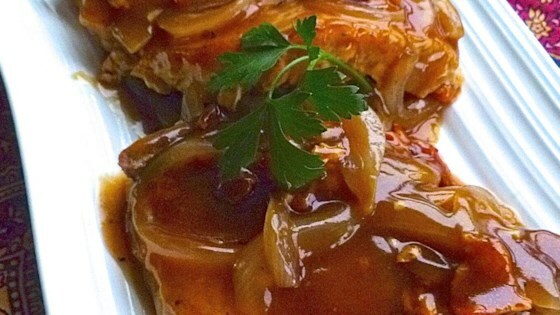 "Smothered pork chops in a white wine reduction with garlic and bacon." Fry bacon in a large skillet over medium-high heat until evenly browned, about 10 minutes. Remove bacon to a paper towel-lined plate. Drain skillet, reserving about 2 tablespoons bacon drippings. Season pork chops with kosher salt and black pepper; cook in reserved bacon drippings over medium-high heat until browned, 3 to 5 minutes per side. Pour white wine over the chops, reduce heat to medium-low, place a cover on the skillet, and cook 2 minutes more. Chop the bacon and add to the skillet along with the onion slices and garlic; replace cover and simmer until chops are no longer pink in the center, about 10 minutes per side. An instant-read thermometer inserted into the center should read 145 degrees F (63 degrees C). Remove pork chops to a paper towel-lined plate to drain. Whisk water and cornstarch together in a small bowl; stir into sauce remaining in skillet. Cook and stir until the sauce thickens. Pour sauce over pork chops to serve. Outstanding! I highly recommend this recipe. I am a novice if it is not red meat on the grill and I think I over cooked the chops but the sauce compensated for that. This recipe is a must try. Good stuff. Chopped bacon and sautéed in pan with onions. Left in pan while adding the chops. Only removed chops to make sauce, but added back to smoother.